From Ruth DeSantis and Don Hotz of UCCF, the University City Community Foundation: With your support we hope to raise enough money to support a lawsuit against the City of San Diego. If you are angry about city council’s recent vote to run a 250PSI pressurized raw sewage line through your neighborhood, here is your chance to fight back! San Diego City Council just voted to approve an incomplete EIR for the Pure Water Project. 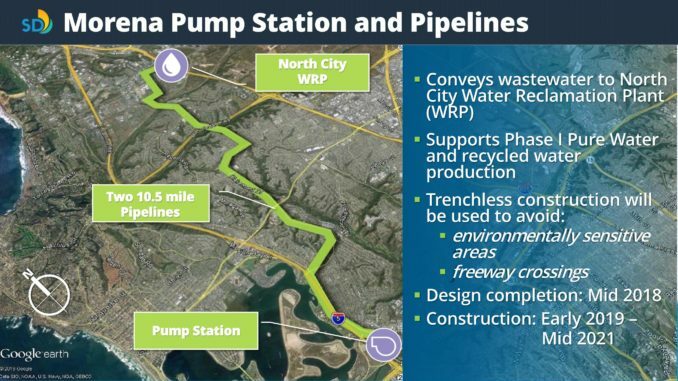 Next year they will run a HIGH PRESSURE RAW SEWER line through the heart of both Clairemont and University City. The route along Clairemont and Genesee was the easiest and cheapest path for the City to choose, but not the safest for residents. Several other routes were immediately dismissed and never considered because they would cost more money and take longer to get approvals, yet they were SAFER for residents.